tracheids with thicker walls. When the tree goes dormant in the fall, either due to seasonal deciduousness (leaf drop) or to cold temperatures if it is evergreen, the cambial cells cease to divide. The following spring, the cambium begins producing earlywood again. The contrast between the late-wood of the previous growing season and the earlywood of the present season is the ring boundary, which can be very sharp and visible to the naked eye. Secondary phloem, the tissue produced to the outside of the vascular cambium, is also a complex tissue that includes an axial and a ray system. 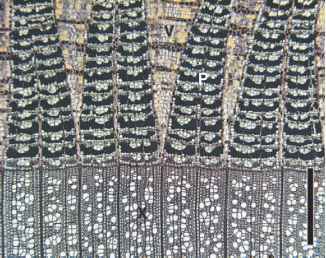 Like the xylem, the axial system in secondary phloem includes conducting cells, either sieve cells in conifers or sieve tube members in the angiosperms, which conduct solutes from the sites of photosynthesis to other parts of the plant. Phloem parenchyma occurs in the axial system, as well as companion cells (angiosperms) and albuminous cells (conifers). Fibers are very common in the secondary phloem of both conifers and angiosperms (FIG. 7.31) , and the pattern of fiber production by the cambium can sometimes be used to identify secondary phloem and bark tissue taxonomically. Although some conifers can produce regular, repeating bands of sieve cells, fibers, and parenchyma, they do not seem to produce these on an annual cycle, so it is not possible to determine the age of bark as it is to date wood by counting the tree rings. Usually only a narrow band of phloem close to the cambium is actively involved in conduction—the functional phloem or inner bark. As the older phloem becomes nonfunctional, there are many histological changes in the tissue, including the collapse of sieve elements, the development of sclereids from parenchyma cells, and/or the deposition of ergastic substances in parenchyma cells. These changes have also been identified in fossil phloem (Smoot, 1984c) . It is in the nonfunctional phloem that subsequent cork cambia may arise in older axes. Vascular rays in the secondary phloem are continuous from the secondary xylem into the secondary phloem and consist only of parenchymatous ray cells. In some plants, the secondary phloem increases tangentially as the stem increases in diameter. This increase can occur by a tangential elongation of either axial or ray parenchyma cells. Some parenchyma cells, especially ray cells, may become meristematic and divide radially to produce additional cells. This process is called dilatation growth and can substantially increase the width of phloem rays. Secondary phloem rays are also important in ethylene signaling during plant responses to wounding and pathogens (Hudgins and Franceschi, 2004). figure 7.31 Cross section of Tilia sp. stem showing secondary xylem (X), phloem (P), and dilating vascular rays (V) (Extant). Bar = 650 pm.